Josh Miller, of District Impressions, mocked Kermit the Frog, Miss Piggy and President Trump. 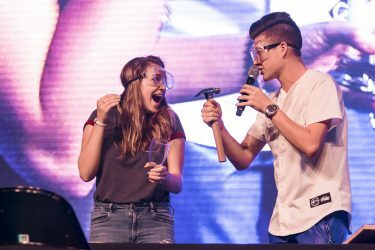 One of those students was Alexandra Steffes, who had arrived at 3 p.m. A loyal Mr. GCU attendee, Steffes said she was assured it would be a phenomenal night. “It’s a male pageant and it’s not about attractiveness – it’s about hilariousness,” she said. To kick off the popular event in GCU Arena, the eight contestants or “tributes” surprised the audience when they ran down from different corners of the arena and on stage to perform a hip hop routine. They then were introduced along with their escorts and presented each of their escorts with a gift. Colson Franse invited an audience member to help him with a magic trick. 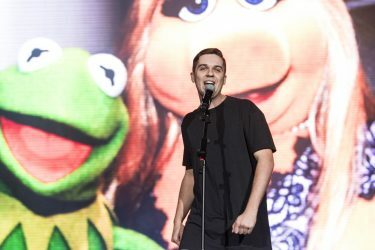 After the eight contestants performed in a talent competition, the arena was narrowed to three for the interview segment. In the end, junior Daniel Williams, an early crowd favorite, was crowned the 2018 Mr. GCU. Other finalists included Bill Babyar and Leif Grigsby. Williams and Grigsby were the standouts in the talent competition, which included rapping and a fife performance. 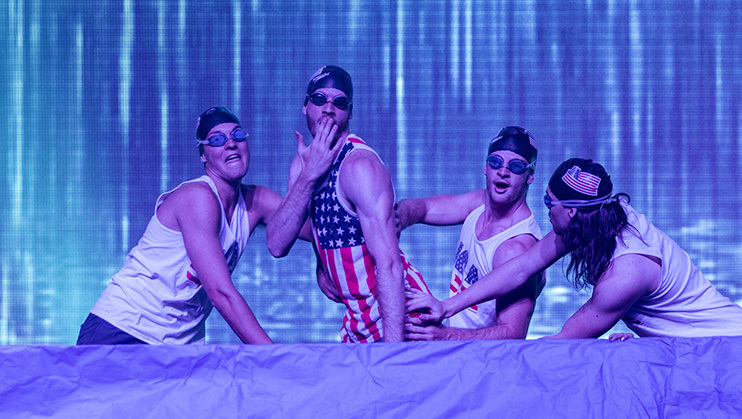 Tyler Weeks and his friends performed a synchronized swimming skit. Brandon Yamaguchi showed off his dance skills. Colson Franse performed a crazy magic trick that had audience members on the edge of their seats and left them scratching their heads. Franse began on stage with a table and six envelopes. Then he asked a random student in the audience to give up her cell phone. Next, she labeled the envelopes one to six and placed a cell phone in each envelope, including her own. Franse then turned around as the student rolled a die, and the crowd watched as Franse destroyed each selected envelope with a hammer and a bucket of water. In the end, the student’s phone survived. Miss Arizona USA, Nicole Smith, was one of the three judges at Mr. GCU. And Jadon Wilson, District Garden, poured heartfelt lyrics with all the emotion he’d written them in as the roar of the crowd encouraged him. The overall talent was “creative, surprising and awkward at times,” according to judge Dr. Tim Griffin, GCU’s Pastor and Dean of Students. Other judges included Director of Student Care Chase Kerrey and Miss Arizona USA Nicole Smith. The emcee was Caleb Duarte. Williams and Grigsby took more bold approaches with their talents. Williams turned his experience at GCU into a rap song dedicated to President Brian Mueller while the audience sang along, “Brian Mueller is my dad.” Grigsby, dressed in a colonial boy costume, played a fife while the audience waved illuminated cell phones. Daniel Williams is crowned Mr. GCU 2018. During their interviews, the contestant were asked about their ideal first dates, their favorite Disney movie and what it would mean for them to win Mr. GCU. 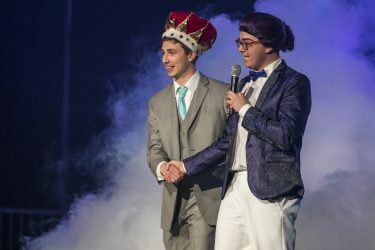 When Williams was crowned Mr. GCU, he said it was a dream come true. His mom, Jennifer Williams, had flown all the way from Wisconsin just to witness the event, and she said the flight was worth it.